Roses are not only beautiful to look at but at the same time they can help with many common ailments. 1. Tea prepared with rose petals and leaves is also effective in cleansing toxins and heat from the body, particularly when they give rise to rashes on the skin and inflammatory (swelling and irritation) problems. Several researched have shown that the rose also possesses properties that increases the body’s immunity and helps to restrict all kinds of infections from becoming larger problems. This is possible owing to the rose’s cleansing or purification properties. 2. Infusion prepared with rose petals may be used to alleviate cold and flu symptoms. At the same time, the infusion is effective in treating sore throats, runny nose as well as congested bronchial tracts. At the same time, roses are also effective in combating infections in the digestive system and restoring the normal and essential bacteria in the intestines. The petals and seeds of the rose have a diuretic effect and are beneficial in relieving excessive fluids from the urinary bladder. This way, they also help in getting rid of the waste and toxic substances in the body through the kidneys. Hence, rose is also considered to be an effective cleanser and purifier. 3. Like the rose hips, the petals of the rose flowers also have numerous remedial uses. 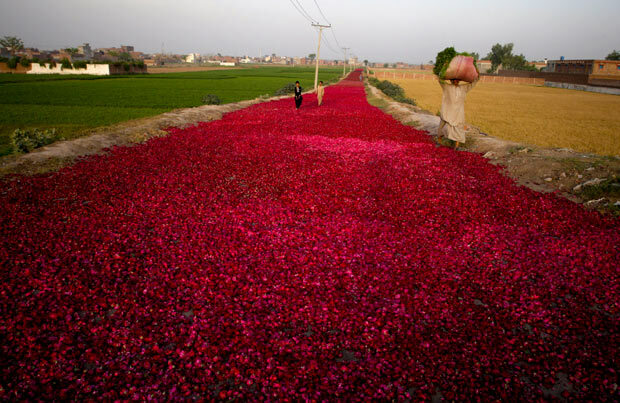 For instance, the rose petals are effective in relieving congestion in the female reproductive system. In addition, the rose petals may also be used to treat the excessive accumulation of fluid in the urinary tract and thereby alleviate pains and, in women, heavy periods. Physicians also recommend the use of rose petals to treat erratic menstrual periods, infertility as well as to perk up sexual desire in individuals. 4. Infusion prepared from the rose petals acts as a useful astringent and is effective for treating diarrhea, enteritis and dysentery. It may be noted here that tea prepared from rose petals may be used as a laxative to clear bowel movement. At the same time, the rose petal tea is also an effective medication for the liver and enhances flow of bile, invigorates as well as purifies the liver and the gallbladder. It also helps in alleviating problems related with lethargic liver like headaches and constipation. Different parts of the rose plant are useful for different purposes and hence they have different applications. The rose hips or fruits of the rose plant, flowers and even the petals are beneficial in some way or the other and used by people as tincture, syrup, essential oil, cream, lotion, rosewater, massage oil, gargle and decoction. The rose flowers are helpful for treating menstrual and liver disorders and may be ingested as a decoction. DECOCTION: A decoction prepared with rose flowers may be blended with another herb motherwort and ingested for treating heavy menstruation. On the other hand, when the decoction is blended with herbs like bai shao yao and xiang fu, it provides an effective medication for liver dysfunction. The petals of the rose flower are beneficial in treating menstruation and stomach disorders. A tincture prepared with them may be used as a gargle for throat infections. TINCTURE: Ingesting approximately three ml of a tincture prepared with rose petals thrice daily is helpful in treating diarrhea as well as sluggish absorption of food. When the same tincture is blended with other herbs like the lady’s mantle, white deadnettle or shepherd’s purse, the medication is effectual for treating erratic or intense menstruation.